Background: With rapid growth of experiences and techniques in the field of Biocellular Regenerative Medicine, clinical scientists and biotechnical advancements constantly seek to understand and optimize uses of the multipotent heterogeneous cellular populations found in adipose tissue complex. The value of including the living, native bioscaffolding within the adipose tissues has likewise gained importance associated with the biologically trophic effects and cellular attachment capabilities believed to positively influence undifferentiated stromal cells in the native sites and biocellular grafts placed. These bonds are felt necessary for cellular activation, proliferation, and contributing to an auto-amplification system within the processes of homeostasis, regeneration, and repair in a “site specific” manner. Appreciation of uses of biologicals (such as platelet-rich and bone marrow concentrates) has grown, and felt to provide a trophic influence on a variety of sites and applications. Study: This study reports on the differences in use of microcannula lipoaspirates undergoing mechanical emulsification in order to provide adult mature adipocyte lysis, preserving tissue stromal vascular fraction (tSVF) in small particle form which can be injected through small bore needles (25-30 gauge). Comparison of the compressed (centrifuged) lipoaspirates with emulsified adipose specimens is made for differences in viability, cell numbers, and total nuclear counts. Simultaneous harvesting of both specimen groups via closed syringe microcannula system was carried out. Following centrifugation at 800 g-force for 5 minutes, comparative 10 cc compressed specimens were submitted for incubation, agitation, and cell separation using a CentriCyte 1000 closed semi-automated system and Vitacyte Clyzme AS at a 1::1 ratio per manufacturer’s instructions. Cellular testing was carried out using flow cytometry for viability, counts and total nucleated counts (following RBC lysis) and compared. Lastly, each emulsified specimen was tested with 1 cc luer syringes through 25, 27, and 30 gauge needles. NOTE: Compressed adipose-derived tissue stromal vascular fraction (AD-tSVF) specimen harvested through 2.11 mm OD microcannulas will not inject through such small bore needles without plugging, and typically require 18-20 gauge needles to easily pass. Conclusions: Comparative testing of 20 specimens each (n=20) revealed no statistically significant differences in mean cell viabilities, numbers or total nucleated cell counts between the non-emulsified AD-tSVF versus the emulsified AD-tSVF specimens. 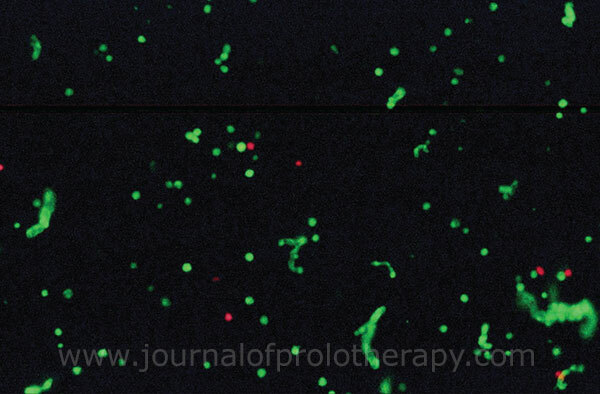 Examination of the emulsified AD-tSVF using fluorescent microscopy and live-dead staining did reveal many small fragments (extracellular matrix or microvascular remnants) with viable stromal cells remaining attached. This suggests that the mechanical emulsification process was effective in reducing the particle size permitting the small needle injection capability while preserving or promoting potentially important cellular attachments, while maintaining a comparable stromal cell viability (without large size mature adipocytes having been mechanically lysed). This emulsified AD-tSVF has been referred to as “microfat” or “nanofat” in current literature. Uses of such microfat or nanofat injections have important potentials in anti-aging, hair regeneration, radiation/sun damage skin, chronic wounds, abnormal scarring, and many ultrasound guided placements in musculoskeletal applications currently using a compressed AD-tSVF + high density Platelet concentrates. Reduction of needle diameter requirement permits significantly less patient discomfort during injections, and permits intradermal placement and small joint placements, currently challenging therapeutic sites. Each mechanically emulsified AD-tSVF specimen successfully achieved injection ability using 1 cc luer syringes and down to 30 gauge needles. This ability changes many applications which involve intradermal patterned injections, scars, radiation damaged skin and chronic wound areas. Patient comfort is significantly improved with use of smaller bore injection needles, whether using sharp or blunt types. NOTE: It is important to clearly understand that the mechanical emulsification alone does not create a true cellular stromal vascular fraction (cSVF), and should not be thought of as a substitute for true cellular isolation and concentration (often reported in laboratory, pre-clinical research, and clinical studies and papers). Due to the regulatory environment in the United States, many seek to provide cellular isolates without use of digestive enzymes in the clinical setting which currently would need an IRB trial and tracking to pursue in the human patient at this time. Testing of the infranatant from both tissue samples revealed a relatively small number of viable stromal cells (typically ranging from 50,000 to 300,000) mixed within cellular debris and RBC/WBC). The infranatant debris and cellular elements are best discarded, as they are very limited in value, and not recommended for routine administration. The vast majority of AD-tSVF available in the compressed graft bears the most important stromal elements, and highest stem/ stromal cell numbers. Laboratory applications seeking to completely isolate stem/stromal cell elements typically involve the chemical digestion of the stroma to accomplish separation of the extensive cell-to-cell and cell-to-matrix connections. To date, there is no mechanical means capable of producing a pure cSVF, but instead advance the fragmentation of the AD-tSVF effectively accomplishing reduction in the large mature adipocytes (rupture) and creation of a small particle size cells retaining some native, bioactive adipose scaffolding. This size reduction permits the injection of a combination of emulsified tSVF and platelet-rich plasma (PRP) concentrates through very small bore needles into dermal and subdermal targets, but only if preserving the viability of its components. Figure 1. 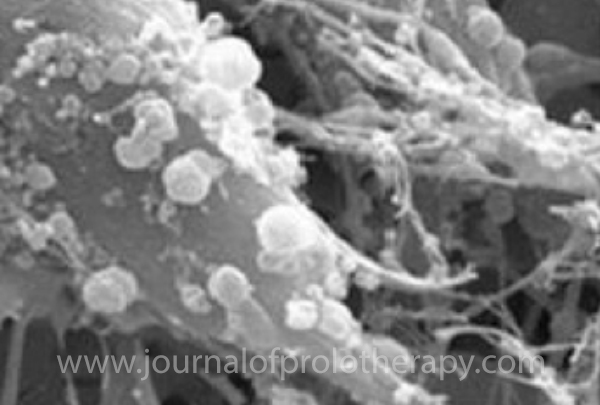 SEM: Adipose Tissue Complex: Adipocytes providing >85% by volume; 12-15% by cell numbers in AD-cSVF. We examine cellular viability changes and numbers between enzymatic digestion (used as baseline) versus mechanical emulsification for potential clinical transplantation uses. We report findings made resulting from emulsifying AD-tSVF (Healeon ACM System Newport Beach, CA, USA by Tulip Medical) as compared to same patient, split samples, using enzymatic digestion (See Materials and Methods.) to create AD-cSVF recorded (CentriCyte 1000, Healeon Medical, Newport Beach, CA, USA). Same patient comparisons of viability and numbers within compressed, non-emulsified AD-tSVF to compressed emulsified AD-tSVF are reported. The emulsification product produced in emulsified AD-tSVF clearly should NOT be considered a pure isolated, concentrated cellular product which can be a means to avoid use of enzymatic digestion, or culture-expansion processing, as some suggest. Examination of the infranatant “pellet”, created when harvested adipose is compressed to create a density gradient, has been suggested to represent an “SVF” alternative to use of enzymes by various biotechnical companies including Healeon ACM (Healeon Medical, Newport, CA, USA); Stromacell (Microaire Aesthetics, Charlottesville, VA, USA); LIPOGEMS (Lipogems Int’l, Milan, IT); REVOLVE Lifecell, Bridgewater, NJ, USA). Figure 2. Gradient Density Separation: Diagrammatic Decantation Versus Centrifugation: Decantation; Right: Post-Centrifugation (1000 g-force for 4 minutes) using lipid separation disk and infranatant layer. The so-called “pelletization” found at the bottom of the centrifuged specimen created in the process does reveal the presence of some viable stem/stromal cells, but in relatively low numbers compared to stem/stromal cells of the full ATC remaining in the harvested graft.8 In addition, besides relatively low viable stem/stromal cell numbers (compared to the full lipoaspirated graft), that “pellet” is also contaminated with cellular debris, RBCs, WBCs, Miscellaneous Stromal Cells, and non-viable matrix populations.9 This should not be confused with production of a pure stem/stromal cellular product produced by enzymatic digestion. Figure 3. Component Assembly Healeon ACM Device (NanoFat mfg. by Tulip Medical for Healeon). Top: Male Input Luer; O-Ring to prevent leakage; Emulsification Screen (Non- Aligned 600 u/400 u screen basket) for final emulsification. Clinical translation of uses of autologous adipose-derived stem/stromal cells has been rapidly expanding with favorable safety and efficacy profiles. Uses in aesthetic, reconstructive and regenerative applications have increasingly been reported, unfortunately with an array of terms and descriptions which confuse the scientific and clinical communities. This paper will sort the specific differences between the two “SVF” entities. Attempts at identification of one or two specific cell groups or singularly critical activated growth factors and signal proteins remains elusive at best. AD-tSVF can be easily harvested from subdermal fat deposits using disposable, microcannula harvest techniques using cannulas ranging from 1.65 mm – 2.4 mm diameters. Centrifugation to compress the graft is recommended to reduce the unwanted extracellular fluid volumes (derived from infusion of carrier fluids into subdermal deposits), while isolating extracellular lipids and debris is well accepted.17 Since it is known that the actual mature adipocytes are resorbed after placement, structural volumes attained in grafting should be credited to the stromal matrix and stem/stromal cell population in the AD-tSVF, and their replacement functions to return to a homeostatic state dictated by the site. The latest advances in the use of micronized AD-tSVF has progressed from relatively crude beginnings in open emulsification process (“nanofat”) as described by Tonnard et al (2013), to the availability of mechanical systems such as low frequency ultrasound18, Revolve, Stromacell, LipoGems, and ACM devices. The desired outcome of each is to effectively reduce the AD-tSVF to a near non-adipocyte cellular SVF product. Although the size of the native adipose matrix (including extracellular matrix (ECM) and peri-adventitial structures is most modified in the LipoGem and ACM devices, neither achieve a pure cellular SVF (AD-cSVF) product. Due to the relative rarity of mesenchymal cells in the bone marrow, adipose has effectively become the tissue of choice when striving to acquire higher numbers of viable stem/stromal cells for transplantation, avoiding complex and expensive culture/expansion to achieve a minimal therapeutic number of such cells.21 One of the core questions to be examined in this pilot study was whether microcannula lipoaspirates could be effectively emulsified and still maintain similar viabilities and stem/stromal cell numbers found in compressed AD-tSVF. We report comparative testing of the centrifuged AD-tSVF followed by enzymatic cell isolation22-24 tested for viabilities and numbers compared to testing of same patient volume following mechanical emulsification of AD-tSVF using the same testing protocols. (See Materials & Methods.) Tonnard reports a high safety and efficacy of use of these emulsified AD-tSVF, but detailed little information regarding the cellular viabilities and numbers that are achievable.25 Advances in techniques and testing analyses began in 2013, resulting in reasonably inexpensive, effective means of providing small particle AD-tSVF for injection into the dermis, scalp, fine lines, sun damaged tissues. Figure 4. Pericytes attachments along microcapillary wall. Figure 5. Mesenchymal Stromal Cells: In Vivo Extensive cell- to-cell and cell-to-matrix connections (Calcein AM; Hoechst Nuclear Stain). Figure 6. 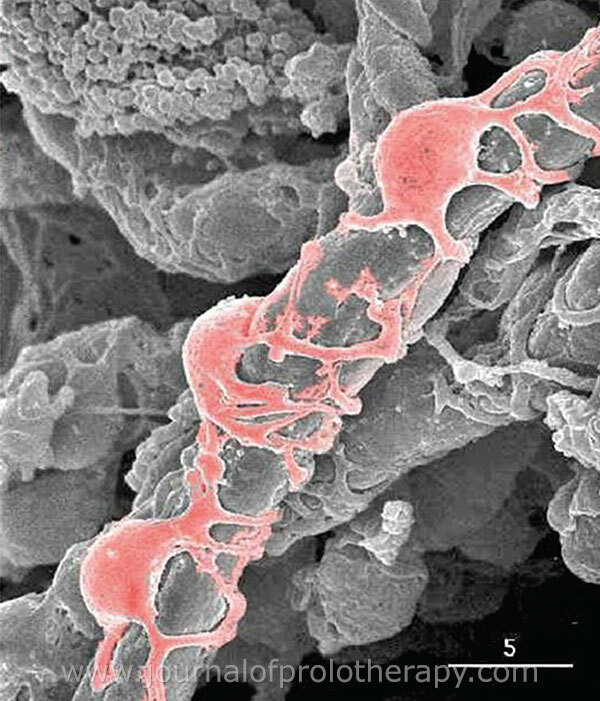 SEM Image Mesenchymal Stromal Cells demonstrating extensive connections within microenvironment of AD-tSVF. 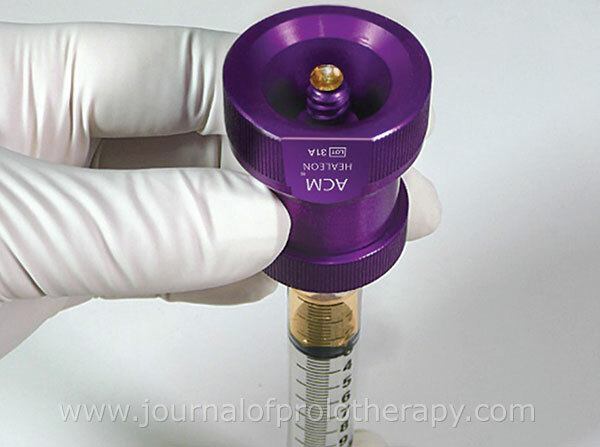 Following harvest of ATC via disposable microcannulas and subsequent centrifugation (at an optimal range of 800 – 1200 g-force (rpm values cannot be used as the sole information of g-force delivery) for 3-4 minutes is effective in layer separation.26,27 The described so-called “SVF Pellet” found at the bottom of the conical tube or syringe centrifuged spun immediately after AD-tSVF harvest does have some loose nucleated and stem/stromal cell elements, but in relative much fewer in number. In our examinations, true stem/stromal cells are found to range in number (typically between 50-300,000 nucleated cells, miniscule compared to the numbers found in the main adipose tissue complex (ATC) graft of the lipoaspirate.28 Significant amounts of cellular debris, WBC, RBCs, and heavier materials are mixed within the residual infranatant “pellet”. It is the author’s opinion that this should not be considered a substitute for utilizing the much higher number of stem/stromal cells and the native bioactive matrix found in the compressed adipose graft. With the ability to utilize the entire harvest specimen in the mechanical processing, it seems more logical and prudent to use the higher concentration product without the debris. 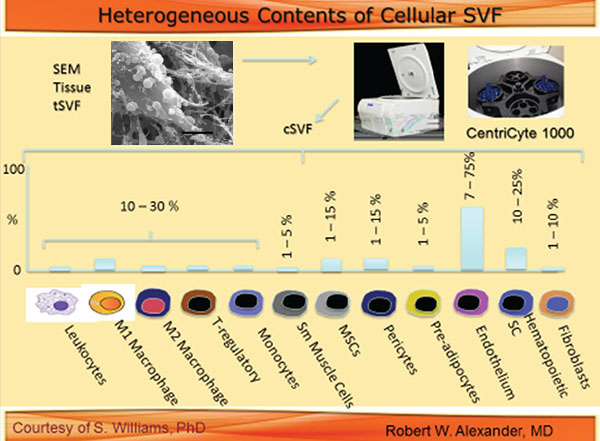 In research publications, papers referencing “SVF” typically describe true cell isolates achieved by digestion/incubation techniques.29 Rather than use of a generic term such as “SVF”, it should be more correctly identified as “AD-cSFV) as the operative study modality. This should be technically clearly identified as AD-cSVF, and should be identified that utilization of a combination of enzymatic digestion and incubation/agitation were utilized to accomplish.30 Many papers now exist outlining such preparations, characterizations, and culture/expansion components, beginning with Zuk (2001, 2002) and revisited in 2013, have clearly identified the widely variable, heterogeneous populations comprising the actual AD-cSVF. In current regulatory terms, current guidelines suggest these may fall into the “more than manipulated” category and, thereby, require specific clinical trials (IRBs) to examine and report the long-term safety and efficacy of such products in human clinical uses. Many clinical trials are, or recently have, reporting safe and efficacious outcomes in a very wide variety of targeted and systemic applications. (www.clinicaltrials.gov). Many existing IRB trials are underway and beginning to report outcomes requiring a 3-5 year period of tracking outcomes and compiling data. In the interim, there have been significant numbers of peer-reviewed, reported cases and multiple case series within the United States and these should not be ignored. Published experiences have reported excellent clinical safety and efficacy in peer reviewed settings. These publications, and trial reports, sets the stage for the much needed standardization and long-term outcome analyses offered in defined clinical trials. Many plastic and cosmetic surgeons are beginning (2016) to submit to a common Registry-type data base which, may encompass use of cell-enrichment protocols proven effective in many international papers, but not within the traditional IRB pathways. This paper makes no effort to compare or characterize the specific cellular components between the AD-tSVF and true AD-cSVF. Recipient site importance has long been established, for example, adipose structural grafting consistently has been reported to do much better in areas where native structural fat deposits were located. Many examples of similarities within many site-specific contributions are available in the peer-review publications outside of grafts of adipose to adipose. This has been reported in musculoskeletal applications, with tendons and ligament structures. Over the past decade, many dermatologic and aesthetic-plastic surgeons have noted significant improvements in skin surface texture, vascularity, and change in the photo-damaged skin of the face associated with the emerging popularity of biocellular-enhanced structural fat grafting. It is important to note that initially, most observations were anecdotal, as the primary focus remained on volumetric retention. In the past 10 years, it has become relatively obvious that a significant amount of the pleasing aesthetic appearance and skin health changes have resulted from biocellular structural grafting techniques placed below the dermis, influencing these important surface changes. For many years, the desire to have the ability to do mid-reticular dermal placement of cellular and PRP products has increased. Until the ability to create a small particle graft of emulsified adipose, it has been unrealistic to attempt injection through the very small needles. This led to examination of options to best create a derivative of grafts which could be reduced in the volume density. Since 2011, Yoshimura’s group clearly demonstrated that the vast majority of mature adipocytes in AD-tSVF do not survive the anoxic conditions creating during and after lipoaspiration, it would suggest that long-term changes in volumes attained may more importantly relate to the precursor cell populations found within the tissue stromal vascular fraction.39,40 With the advent of these findings, it is clear that the mature adipose contributes relatively little to any recipient sites, and suggests that placement in the dermal tissues might have great potential in improving vascularity of the skin and adnexa.41 This paper focuses on the changes encountered with mechanical emulsified of AD-tSVF and open the potential use of mechanically emulsified samples to offer stem/stromal cell viability and numbers suggesting effective alternative in cases of severe radiation damage, aging changes, hair regenerative capabilities, and wide variety of uses in damaged-degenerative musculoskeletal and neurological issues. Figure 7. Live/Dead Stain in Flow Cytometer. Shows viable mononucleated cells (green); strings of emulsified matrix with viable cells attached (green linear); non-viable mononucleated cells (red). Currently, confusing regulatory guidelines and conditions within the USA pushes interested practitioners to strongly attempt to avoid use of enzymatic digestion. Guidelines suggest chemical dissociation constitutes “more than minimally manipulation” as such, suggest it creates a “drug” which would require a complex and expensive IND pathway. Use of mechanical emulsification and biocellular applications are currently considered as falling within the clinical classification as “autologous, same day, practice of medicine” exclusion. REMINDER: The author warns that the stromal product achieved by mechanical emulsification should NOT considered as safe for IV or other parenteral placement alternative, even using microfiltration devices. Figure 8a. Disposable Microcannula Setup for closed syringe Tulip Medical GEMS tm for AD-tSVF lipoharvesting. Top: Internal locks for plunger; Middle: 3 microcannula tips (see Figure X for close up); sterile, Bottom: Clear luer-to-luer transfer. Figure 8b. 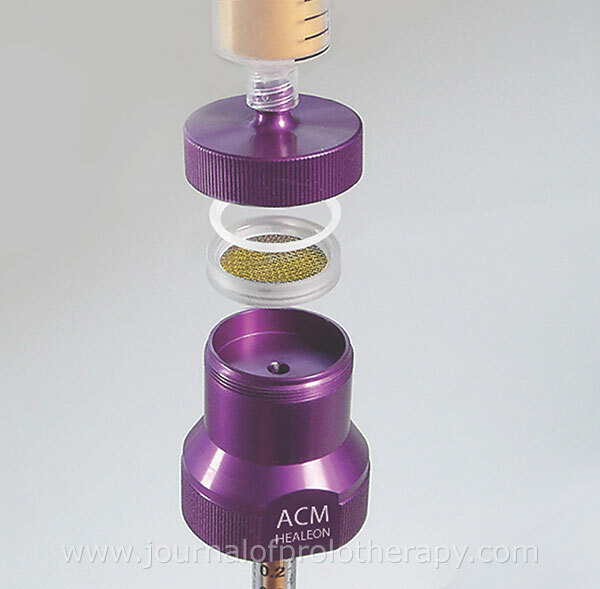 Close Up Tulip GEM microcannulas: Top: 2.11 mm Multiport Infiltrator; Middle: 2.11 mm Off-Set Spiral (Carraway) Harvestor; Bottom: Single Port, Blunt Injector (variable sizes). 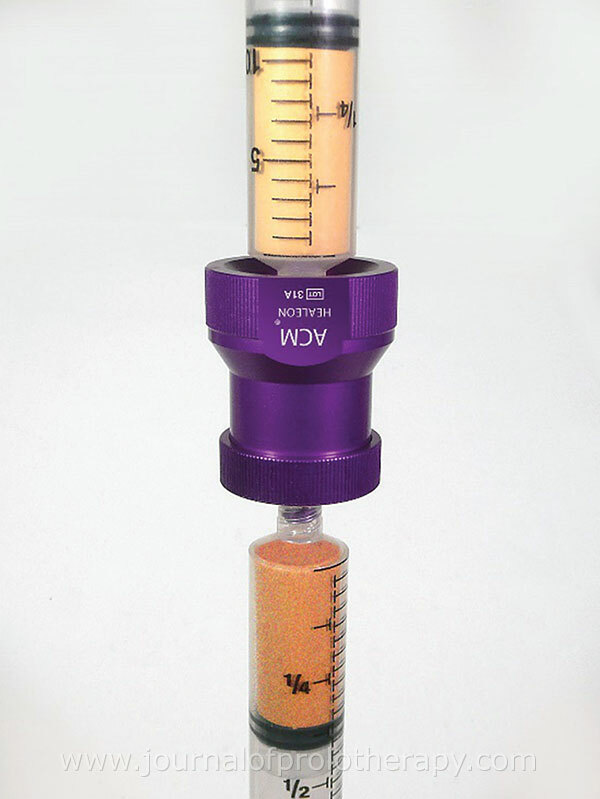 Standard coated, disposable super-luer lok™ microcannulas of 2.11 mm OD were utilized for carrier fluid infiltration (20 cc of dilute xylocaine 0.05% with 1 x 10-6 epinephrine) and microcannula harvest using 2.11 mm OD offset Carraway Harvesting cannula. Samples were harvested into standard 20 cc BD Syringes (Becton Dickenson, MD, USA) following the published protocol. Graft sizes were standardized to approximately a compressed volume (i.e. following specimen centrifugation, 5 min at 800g force) of lipoaspirate of 10 cc for each sample examination in a Healeon Medical CentriCyte 1000 centrifuge. Each patient was cleared by routine history and physical examination, and provided a complimentary CBC taken at time of venipuncture for testing as actual platelet baselines. Each patient was individually consented for the harvested adipose tissues, and informed of the purpose of the removal to test for differences of AD-tSVF compared to emulsified AD-tSVF. No patients were treated using this sampling process or its products. Each sample was tested for the ability to inject through a 1 cc luer syringe mounted with a 5/8” 30 gauge needle. Following harvest, each donor site was covered with small sterile absorbing pad, light triple antibiotic ointment to opening, and donor site closed using a closed cell medical grade foam over the areas of actual harvest, followed by light elastic compression (to greatly reduce post-harvest bruising). Male subjects were harvested from the lower abdomen or flank areas, and female subjects according to primary distribution (from lower abdomen, flanks, or lateral femoral sites). Figure 9a. Chamber Filling with High-Density Platelet-Rich Plasma to displace air, and create the biological (HD PRP) + cellular mix (AD-tSVF) known as Biocellular Therapeutic Modality. Figure 9b. Final Emulsification of AD-tSVF through screen mesh chamber. 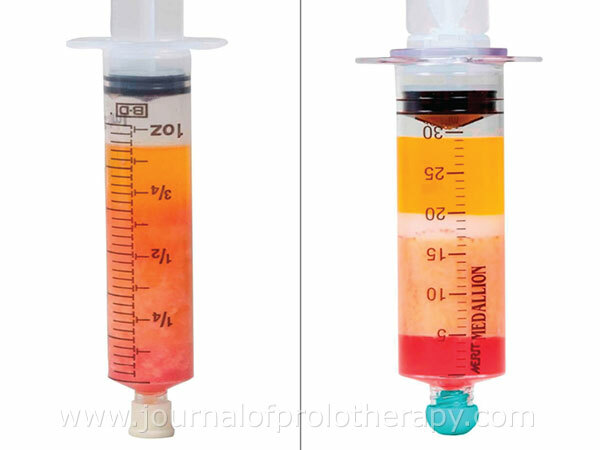 Bottom: Lipoaspirate (AD-tSVF) attached to luer on INPUT side; Top: Receiving syringe containing HD PRP and Emulsified AD-tSVF. Comparative samples (10 cc compressed adipose graft) were placed into two separate 50 cc Healeon Specimen Containers, in a total volume of 10 cc compressed adipose graft each, and submitted for cell separation and isolation in the semi-automated, closed CentriCyte 1000 machine (Healeon Medical, Newport Beach, CA., USA) following device manufacturer’s standard written protocol. Enzymatic digestion was completed using Vitacyte Clyzyme AS at a 1:1 ratio, and incubated/agitated at 37 degrees C for 30 minutes. Post-digestion, centrifugation for 5 minutes at 800 g- force, 2.5 cc of pellet and infranatant fluid was mixed with 2 cc platelet poor plasma and diluted to 50 cc. Following this neutralization and rinsing step, the specimen syringe was re-centrifuged for 3 minutes at 800 g-force and AD-cSVF pellet recovered per protocol. Testing of residual collagenase in the final pelletized was performed in each sample, and found to contain residual collagenase blend at levels beneath the measurable limits in all samples. First testing was performed on the compressed AD-tSVF (non-emulsified) using the standard equipment manufacturer’s protocol. The comparative sample of 10 cc compressed adipose graft was emulsified in the ACM device as described above. The emulsified specimen was then submitted for identical cell separation and isolation protocol as described for the compressed graft only sample. Each sample of AD-cSVF created was submitted for identical cellular testing using a MoxiFlow flow cytometer (ORFLO, Ketchum, ID, USA) and their proprietary Viability Reagent (Cat # Mxa055). Recording of viabilities, cell concentrations, and followed by separate chamber TNC after use of ZAPoglobin II (Becton-Coulter, USA) for cellular membrane lysis and testing (excluding RBCs). Twenty comparative samples (n=20) from each group were run according to the Healeon Medical CentriCyte 1000 protocol per manufacturer instructions outlined above. The mean sample sizes were 10.07 cc representing a post-centrifugation cycle of 800 g force for 5 minute per manufacturer’s protocol and are described herein as “compressed adipose graft” or AD-tSVF. There were no discovered or reported donor complications from the sterile microcannula harvest, with each patient followed for a 30 day period following lipoaspiration procedure. Immediately after harvest, light compression of the donor sites was carried out for 24 hours, upon which removal was authorized, and replacement of dressing to simple type telfa pad covering until surface closure of an 18 gauge needle opening was noted. Patients were not treated with systemic antibiotic coverage. There were no medication reactions, surface irregularities, prolonged soreness, cellulitis, infections, hematomas, excessive hemorrhage, atypical scarring, or narcotic level pain encountered. Very minimal subdermal bruising was noted under the compressed closed cell, medical grade foam placed immediately post-operatively over the donor’s harvest area. The harvesting was performed using a very dilute solution of 0.05% Xylocaine solution with 1:1,000,000 epinephrine as the carrier fluids, in approximately 1:1 ratio of infiltrated solution to the volume extracted from each site. In the abdominal harvest sites, care was taken to accomplish the micro-aspiration beneath Scarpa’s Fascia to avoid visible surface irregularities. Post-harvesting medication recommended was acetaminophen 500 mg taken at 6-8 hour intervals if needed. The first half of the compressed fat grafts harvested (centrifugation only) was submitted for the standard closed protocol processing as described in Materials & Methods, providing enzymatic digestion and incubation cycles according the CentriCyte 1000 manufacturer’s protocol. Neutralization and rinsing was completed using sterile 0.9% saline solution and 2 cc of autologous platelet poor plasma (PPP), rinsing the initial pelletized AD-cSVF from 2.5 cc to a volume of 50 cc per protocol. Final centrifugation protocol was then performed and 2.5 cc of pellet and infranatant removed for testing. These same numbers were used for comparison to the second sample which underwent emulsification using the ACM System device prior to enzymatic processing, and utilized to provide the baseline viabilities and counts which would potentially be altered by the mechanical disruption process. Prior to cellular separation, 0.2 cc non-emulsified AD-tSVF was attempted to be injected from a 1 cc luer syringe and standard 30 gauge needle, and found to consistently plug, preventing easy injection. Table 1. Comparative outcomes of testing AD-tSVF versus emulsified AD-tSVF. (n=20 each sample set). Importance of these observations and findings is felt significant in that the process of mechanical disruption provided by the ACM (nanofat) device did not significantly lower stromal cell viability or cell numbers as measured with standard flow cytometry. In this paper, no cell culture expansion, membrane characterizations, of isolation of component cells in the heterogeneous AD-cSVF populations typically encountered was examined. We are currently in the process of evaluation of these components, including In Vitro processing and quantification of specific cells, characterization, cell culture proliferative capabilities, and cryopreservation of cells derived from mechanical emulsification processing. Testing of samples of emulsified AD-tSVF using standard 1 cc luer syringes for injection ability through 25, 27, and 30 gauge needles. In every sample, this was demonstrated to be easily accomplished without blockage or significant resistance. Over the past decade, significantly increasing experiences using compressed AD-tSVF and HD PRP combination (Biocellular), has been extensively and effectively documented in clinical use. The Biocellular combination has confirmed a very high safety profile and been reported in a large number of case reports, small and large case series, and from clinical trials using Adipose Tissue Complex derivatives. Uses of both the non-emulsified AD-tSVF and the Biocellular AD-tSVF have been published in peer-reviewed literature and well established in aesthetic-reconstructive surgery and variety of musculoskeletal indications. Uses of the emulsified AD-tSVF product has been utilized for more than two years, and in initial reports have a very high safety and efficacy profiles noted. Both forms of AD-tSVF continue to gain significant clinical uses and momentum, with providers utilizing the exclusion from guidelines claiming the “non- or less than minimally manipulated” category, using the Practice of Medicine exception in the USA (autologous, same day procedure, same surgeon, etc.). This study confirms that the emulsified AD-tSVF maintains very similar viabilities and cellular numbers as the non-emulsified AD-tSVF. It is important to realize that the complex native cell groups and supportive tissues found in the ATC may, in fact, represent a more valuable and potent therapeutic entity, than trying to “guess” which cellular components or chemicals contained are the “key” to success. Many now believe, and have tested, advantages of leaving the component parts of the tSVF and reported that outcomes did best when the targeted site could choose from the variety of cells, growth factors, structural native scaffolding, and cytokines, rather than isolating specific cell types or structures. The “smorgasbord” approach seems to be more effective than selecting single cell types or chemical groups, all of known important in regenerative medicine. It is the author’s experience that use of AD-tSVF combined with high density platelet-rich plasma (HD PRP) in aesthetic and orthopedic applications outperform either the tSVF OR the HD PRP alone. This combination is gaining acceptance as “Biocellular Therapy”. Current examination using clear, high-density platelet-rich platelets is currently underway, particularly for those applications seeking significantly higher concentrations of growth factors, cytokine, and signal proteins with low hematocrit. In the author’s experience, the use of AD-tSVF and HD PRP in which platelet concentrates containing >1 x 106 /ul tends to result in earlier and more ultrasound documentation of comprehensive improvement in most orthopedic applications. Uses for some facial and scalp skin surface changes (including hair regeneration) appear to respond to PRP concentrates of lower concentration (2.5 x measured baseline) levels when mixed with the emulsified AD-tSVF product and injected in the dermal or close subdermal areas. This may be contributed to by the more extensive vascularity of the facial and scalp areas compared to distal extremities. Clinical trials are now underway to study the effects of low hematocrit, high-density HD-PRP (defined >4 X measured patient baseline) using the emulsified AD-tSVF products in these applications. Great advantages for use of small needle injection ability is apparent from a clinical standpoint. Uses in aesthetic-plastic surgical and dermatological applications become feasible, permitting intradermal placement for improved vascularization, texture and appearance changes. In addition, uses for male and female hair loss can be addressed using a biocellular product, targeted at the hair bulge and follicular bulb area. The actual effects produced have been documented, but the mechanism of such changes remain a subject of current applied clinical research and controlled clinical trials. 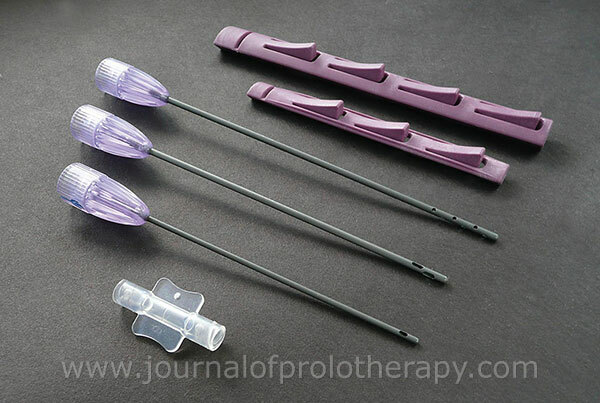 In Orthopedic Medicine, this facilitates use of much smaller diameter needles for patient comfort, while providing the ability to use in small joint or superficial targets. With the evolving applications in anti-aging, a variety of aesthetic and reconstructive uses, and small target guided injections in musculoskeletal applications, and the ability of using very small aperture needles are optimal for placement in dermal, chronic wounds, small joints, certain ligament-tendon targets. This is very attractive for the provider, and more easily tolerated by the patients. This study provides evidence of the ability to achieve small particle AD-tSVF while preserving viable stem/stromal cells in high numbers can be attained using a sterile closed system with essentially minimal to no impact on stromal and cellular components. The ACM device provided a simple, closed mechanical processing in this comparison study, and was shown to effectively compared to use of AD-tSVF, in a safe and cost effective manner. Use of the StromaCell (Microaire Aesthetics, Charlottesville, VA, USA), Lipogems (Lipogems International S.p.A, Milan, Italy), REVOLVE systems do accomplish some degree of emulsification, but at much higher equipment, consumable cost, and inconsistent inject ability via small needles. The use of the ACM system, as tested, was simple to use, markedly less expensive, required very little instrumentation, and provided an easy means to mix PRP to create a Biocellular therapeutic injectable. Reduction of consumable supplies costs required to create an emulsified AD-tSVF + PRP concentrates can effectively reduce patient costs for such care, making it more available to patients in need. At the time of this writing, the author is treating and tracking outcomes in each of the discussed areas of potential uses for Biocellular emulsified AD-tSVF injections. The ability to provide a small particle stromal and Biocellular combination is clearly considered to offer a high potential for site-specific, cellular proliferative and reactive capabilities to targets. It is believed that the local microenvironment (niche) where the biocellular products are carefully placed, support the early acceptance and provide important immunomodulatory capabilities and advantages reported in use of components of the adipose-derived stromal complex. We provide initial evidence to support the ability to effectively reduce the AD-tSVF particle size for small bore needle injections, while not destroying the cellular and stromal interactions. We are currently participating in a multi-centric, controlled Clinical Trials for use of emulsified AD-tSVF with PRP and cell-enrichment AD-tSVF with PRP concentrates in a hair regenerative applications. Many more controlled trials and studies are needed to further confirm the long-term safety and efficacy of such processing and therapies, with efforts to determine optimal cellular types and concentrations. Learning how mechanical emulsification impacts AD-tSVF, is an important first step in determining potential impact on the heterogeneous cell population. Appreciation of the complex, heterogeneous elements comprising emulsified AD-tSVF will eventually include knowledge of threshold viability, types, and numbers of cells and matrix needed for optimal clinical effects. This will be advanced with additional studies examining cell characterization, and examine their important proliferative capabilities and energy. We are currently examining the component processes and analyzing the important growth factors, exosomes, signal proteins, and various micro-environmental influences important to understanding how we can optimize the uses of biocellular regenerative medicine applications. The author wishes to thank our clinical and laboratory staff, Mrs. Nancy L. Smith and Ms. Susan Riley for their endless hours and efforts in order to facilitate patients, sample gathering and testing. Without such devotees, clinical papers cannot be reported. There are no conflicts of interest reported in this paper or its content. 1 Alexander RW. Understanding adipose-derived stromal vascular fraction (AD-SVF) cell biology and use on the basis of cellular, chemical, structural and paracrine components: a concise review. Journal of Prolotherapy. 2012;4(1):e855–e869. 2 Tonnard P, et al. Nanofat grafting: basic research and clinical applications., Plast Reconstr Surg. 2013;152:1017-1026. 3 Millan A, Landerholm T, Chapman J. Comparison between collagenase adipose digestion and stromacell mechanical dissociation for mesenchymal stem cell separation. McNair Scholars J CSUS. 2014;15:86-101. 4 Raffiani M, Tremolada C. Micro-fractured and purified adipose tissue graft (lipogems) can improve the orthognathic surgery outcomes both aesthetically and in post-operative healing. CellR4. 2014:2(0):e1118. 5 Bianchi F, Maioli M, Leonardi E, et al. A new nonenzymatic method and device to obtain a fat tissue derivative highly enriched in pericyte-like elements by mild mechanical forces from human lipoaspirates. Cell Transpl. 2013;22:2063-2077. 6 Suga H, Eto H, Aoi N, et al. Adipose tissue remodeling under ischemia: death of adipocytes and activation of stem/progenitor cells. Plast Reconstr Surg. 2010;126(6):1911–1923. 7 Alexander RW, Harrell DB. Autologous fat grafting: use of closed syringe microcannula system for enhanced autologous structural grafting. Clinical, Cosmetic and Investigational Dermatology. 2013;6:91-102. 8 Mandle-Alexander, Unpublished Data 2011. 9 Conde-Green A, et al. Comparison between stromal vascular cells’ isolation with enzymatic digestion and mechanical processing of aspirated adipose tissue. Plastic & Recon Surgery. 2014;54. 10 Rigotti G, Marchi A, Galie M, et al. Clinical treatment of radiotherapy tissue damage by lipoaspirate transplant: a healing process mediated by adipose-derived adult stem cells. Plast Reconstr Surg. 2007;119:1409-1422. 11 Moseley T, Zhu M, Hedrick M. Adipose-derived stem and progenitor cells as fillers in plastic and reconstructive surgery. Aesthetic Plast Surg. 2008;32:48-55. 12 Alexander, Robert W. Author Textbook, Use of PRP In Autologous Fat Grafting, in Autologous Fat Grafting, Textbook, Shiffman, M. ed., Springer, Berlin; 2010;14:87–112. 13 Alexander RW. Fat transfer with platelet-rich plasma for breast augmentation. Shiffman M, editor. Breast Augmentation: Principles and Practice. Berlin: Springer; 2009:451–470. 14 Sadati KS, Corrado AC, Alexander RW. Platelet-rich plasma (PRP) utilized to promote greater graft volume retention in autologous fat grafting. American Journal of Cosmetic Surgery. 2006;23(4):627–631. 15 Tobita M, Tajima S, Mizuno H. Adipose tissue-derived mesenchymal stem cells and platelet-rich plasma: stem cell transplantation methods that enhance stemness. Stem Cell Res Ther. 2015;6:215-222. 16 Kurita M, Matsumoto D, Shigeura T, et al. Influences of centrifugation on cells and tissues in liposuction aspirates: optimized centrifugation for lipotransfer and cell isolation. Plast Reconstr Surg. 2008;121(3):1033–1041. 17 Bright R, Bright M, Bright P, et al. Isolation of stem cells from adipose tissue by ultrasonic cavitation and methods of use. WO. 2014; 2014000021a1. 18 Crisan M, Yap S, Casteilla L, et al. A perivascular origin for mesenchymal stem cells in multiple human organs. Cell Stem Cell. 2008;3:301-313. 19 Alexander, RW. Unpublished data. 20 Alexander RW. Autologous fat grafts as mesenchymal stromal stem cell source for use in prolotherapy: a simple technique to acquire lipoaspirates. J of Prolo. 2011;3(3):680-688. 21 Zuk PA, Zhu M, Mizuno H, et al. Multilineage cells from human adipose tissue: implications for cell-based therapies. Tissue Eng. 2001;7(2):211–238. 22 Zuk PA, Zhu M, Ashjian P, et al. Human adipose tissue is a source of multipotent stem cells. MolBiol Cell. 2002;13(12):4279–4295. 23 Zuk P. Adipose-derived stem cells in tissue regeneration: a review. Cells. 2013: ID 713959, 35. 24 Carelli S, Messaggio F, Canazza A, et al. Characteristics and properties of mesenchymal stem cells derived from micro-fragmented adipose tissue. Cell transplant. 2014; doi: 10.3727/096368914×681603. 25 Kurita M, Matsumoto D, Shigeura T, et al. Influences of centrifugation on cells and tissues in liposuction aspirates: optimized centrifugation for lipotransfer and cell isolation. Plast Reconstr Surg. 2008;121(3):1033–1041. 26 Conde-Green A, et al. Comparison between stromal vascular cells’ isolation with enzymatic digestion and mechanical processing of aspirated adipose tissue. Plastic & Recon Surgery. 2014;54. 27 Mandle R, Alexander RW. Unpublished data. 28 Oberbauer E, Steffenhagen C, Wurzer C, et al. Enzymatic and non-enzymatic isolation systems for adipose tissue-derived cells. Methodology Open. 2015;e1-14. 29 Alderman D, Alexander RW, Harris G. Stem cell prolotherapy in regenerative medicine: background, research, and protocols. 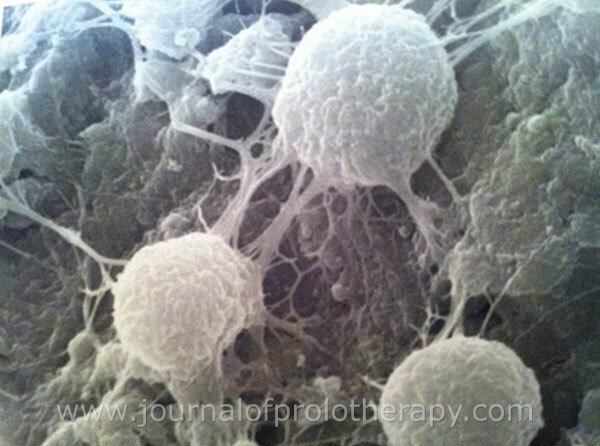 J. of Prolotherapy. 2011;3(3):689-708. 30 Albano J, Alexander RW. Autologous fat grafting as a mesenchymal stem cell source and living bioscaffold in a patellar tendon tear. Am J. Sports Med. 2011;21:359-361. 31 Oliver K, Alexander RW. Combination of autologous adipose-derived tissue stromal vascular fraction plus high-density platelet-rich plasma or bone marrow concentrates in achilles tendon tears. 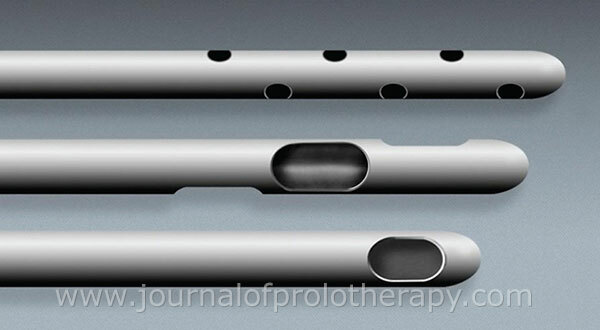 J of Prolotherapy. 2013;5e895-e912. 32 Alderman D, Alexander RW. Advances in regenerative medicine: high-density platelet-rich plasma and stem cell prolotherapy. Journal of Prolotherapy. 2011;10:49–90. 33 Blaber S, Webster R, Cameron J, et al. Analysis of in vitro secretion profiles from adipose-derived cell populations. J of Translational Med. 2012;10:172. 34 Abuzeni P, Alexander RW. Enhancement of autologous fat transplantation with platelet-rich plasma. Am J Cosmetic Surg. 2001;18(2):59-70. 35 Alexander RW. Understanding adipose-derived stromal vascular fraction (svf) cell biology in reconstructive and regenerative applications on the basis of mononucleated cell components. J. of Prolo. 2013;10:15. 36 Alderman D, Alexander RW. Advances in regenerative medicine: high-density platelet-rich plasma and stem cell prolotherapy for musculoskeletal pain. PPM. 2011;49-90. 37 Eto H, Suga H, Inoue K, et al. Adipose injury-associated factors mitigate hypoxia in ischemic tissues through activation of adipose-derived stem/progenitor/stromal cells and induction of angiogenesis. Am J Path. 2011;178(5):2322–2332. 38 Kato H. Short- and long-term cellular events in adipose tissue remodeling after non-vascularized grafting. Paper presented at the International Federation for Adipose Therapeutics and Science Miami, 9th Annual Symposium on Adipose Stem Cells and Clinical Applications of Adipose Tissue; 2011 Nov 4–6; Miami, Florida, USA. 39 Alexander RW. Autologous fat grafts as mesenchymal stromal stem cell source for use in prolotherapy: a simple technique to acquire lipoaspirates. J of Prolotherapy. 2011;3(3):680-688. 40 Shah F, Wu X, Dietrich M, et al. A non-enzymatic method for isolating human adipose-derived stromal stem cells. Cytother. 2013; 15:979-985. 41 Aronowich JA, Lockhart R, Hakakian C. Mechanical versus enzymatic isolation of stromal vascular fraction cells from adipose tissue. SpringerPlus Open Access. 2015;4:717- 724. 42 Brizzi M, Tarone G, Defilippi P. Extracellular matrix, integrins, and growth factors as tailors of stem cell niche. Curr Opin Cell Biol. 2012;24(5):645-651. 43 Soo-Yyun K, Turnbull J, Guimond S. Extracellular matrix and cell signaling: the dynamic cooperation of integrin, proteoglycan, and growth factor receptor. J Endocrin. 2011;209:139-151. 44 Guilak F, Cohen DM, Estes BT, Gimble JM, Liedtke W, Chen CS. Control of stem cell fate by physical interactions with the extracellular matrix. Cell Stem Cell. 2009;5(1):17–26.